Just one week after the first season debuted in its entirety, YouTube Red has renewed Cobra Kai for Season 2. The 10-episode second season will start production at some point this fall, with both William Zabka and Ralph Macchio returning to reprise their roles once again as Johnny Lawrence and Daniel LaRusso. Here's what Susanne Daniels, Global Head of Original Content for YouTube, had to say in her statement about the renewal. "This series had all of the right elements from the very beginning -- compelling characters, a storied rivalry, and the talented original stars. The way viewers have embraced the new twist on this beloved franchise has been nothing short of amazing, and we're thrilled to partner with Sony TV, Overbrook and the extraordinary creative team led by Josh Heald, Jon Hurwitz, and Hayden Schlossberg to create a second season." 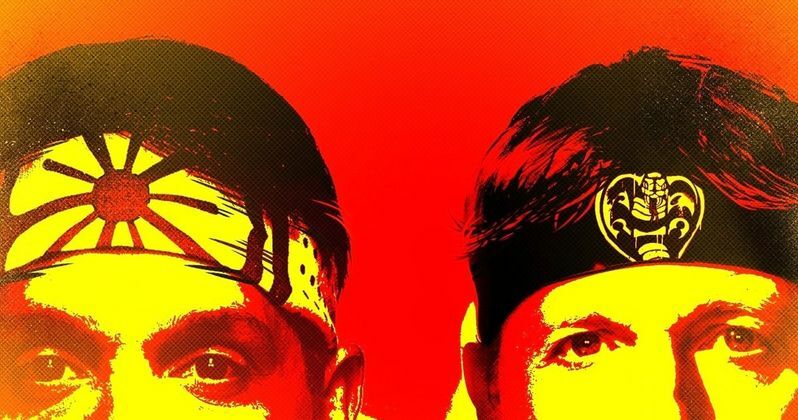 Since debuting on the YouTube Red streaming service last week, Cobra Kai has generated more than 20 million views. The series centers on Zabka's Johnny Lawrence, who gets a shot at redemption when he re-opens the infamous Cobra Kai dojo he trained at as a boy. This reignites his rivalry with Macchio's Daniel LaRusso, who has grown up to be successful, running his own car dealership, although he has been struggling following the loss of his mentor, Mr. Miyagi. Other cast members slated to return for the second season include Xolo Mariduena as Miguel Diaz, Tanner Buchanan as Robby Keene, Mary Mouser as Samantha LaRusso and Courtney Henggeler as Amanda LaRusso. Here's what Jeff Frost, President Sony Pictures Television, had to say in his statement. "We are so elated with the performance of Cobra Kai and our incredible partnerships with Josh, Jon, Hayden and Overbrook and of course, You Tube Red. This has been a remarkable experience and the audience reaction only further validates what we already knew - that this team and series is exceptional and incredibly special." Cobra Kai was written and executive produced by Josh Heald, Jon Hurwitz, and Hayden Schlossberg, who will all continue to serve as showrunners in the second season. The showrunners also directed most of the Season 1 episodes, with Hurwitz and Schlossberg directing the pilot and second episode, plus the final two episodes of the season, Jennifer Celotta directing the third and fourth episodes, Josh Heald directing the fifth and sixth episodes and Steve Pink directing the seventh and eighth episodes. The showrunners are also expected to direct most of the Season 2 episodes as well. Here's what Heald, Hurwitz and Schlossberg had to say in their joint statement. "Continuing the Karate Kid saga with YouTube Red has been a dream come true. We are grateful to all our creative partners for giving us the freedom to revisit and expand the LaRusso/Lawrence rivalry. And we are truly exhilarated by the tidal wave of support from fans of this story, both old and new." Season 2 of Cobra Kai will also be executive produced by James Lassiter and Caleeb Pinkett for Overbrook Entertainment, in association with Sony Pictures Television Studios. YouTube Red has yet to announce a premiere date, but with filming starting this fall, it's possible that the new season could be ready for a May 2019 premiere. Hopefully we'll find out more about the new season of Cobra Kai soon.